The 1815 eruption of the Indonesian volcano Mount Tambora was classified as a VEI-7 event, one of the most powerful in recorded history. The following year was known as “The Year without Summer”, during which time abnormally low temperatures destroyed crops in Northern Europe, Northeastern United States and eastern Canada. What, you may well be asking, has this Big Bang got to do with the bicycle? Horses were the predominant form of land transport at the time, but they were expensive to buy and equally expensive to keep running. It wasn’t only humans that starved due to crop failure, horses too suffered and there is evidence that suggests this triggered research into alternative forms of transport by Baron Karl von Drais. Whatever the motivation, in 1818 he patented the first verifiable and popular two-wheeled human-propelled vehicle, the “running machine” (Laufmaschine). It featured two wheels, was built mostly of wood, with iron-shod wheels, a rear wheel brake and a trail of 6 inches for the front wheel. It weighed 48lbs. Primitive it may have been but it proved popular and it set in train a series of innovations that would have a significant impact on society. Some 50 years later saw two technical innovations in two-wheeled transport in terms of propulsion and construction. Exactly who invented what is not clear, however what is certain that frames started to be made of metal which allowed for more elegant, lighter designs and also for mass production which one assumes helped reduce costs and therefore increase market size. In addition, and more importantly rotary cranks with pedals were fitted to the front wheel for direct drive motive power, rather than the less efficient “scooting” style of foot propulsion of the earlier Draisine. Thus the “Boneshaker” was born. While this direct drive was an improvement, the only way that “gearing” (and thus speed) could be increased was to increase the size of the front wheel. A larger diameter wheel meant that the bike would travel further for each rotation of the pedals, with the penalty of making hills harder to ascend. Wooden-spoked, iron-rimmed wheels were too heavy to be of practical use in this regard but a new form of lightweight wheel construction was invented in 1869; the wire spoke tension wheel. The excellent weight-to-strength ratio of the wire spoked wheel led to front wheels of gargantuan proportions (5ft!) and a corresponding decrease in diameter of the rear wheel and thus we come to the famous, outlandish and precarious “Penny Farthing” where the size of the drive gear was directly proportional to the leg length of the rider. Other technical features of these bikes included hollow wheel rims, hollow tubing, friction-reducing ball bearings and solid rubber tyres. Many adverts claimed these bikes to be “light”, but they still weighed in at some 40lbs. To our eyes the Penny Farthing looks preposterous, but the height of these mounts was not dissimilar to that of riding a horse so for many it was quite a familiar experience. But with the rider’s weight more or less directly above the pivot point of the front wheel hub, it wouldn’t take much of a bump in the road to off the rider. Such was the popularity of the Safety Bicycle that social conventions were challenged s many women started to ride and this necessitated a new style of fashion; the voluminous dresses of the Victorian era were just too impractical on a bike. The bicycle also liberated women socially as many were able to travel independently for the fist time. Punch cartoon: "The Bicycle Babe"
With the Penny Farthing form factor, the bicycle had reached a technological cul-de-sac. There was a finite size for the front wheel, multiple gears were an impossibility, construction techniques were as advanced as they could be with the materials of the day, women at the time could not ride them because of social limitations of what they were allowed to do and the dress they had to wear. Not everyone would dare to ride them; the market size it could reach was limited by its design weaknesses and social conventions. The only practical option open to engineers was to use some kind of indirect drive mechanism to the back wheel and the first successful development here was the introduction of the chain drive. The same gear represented by a large diameter Penny Farthing wheel could be achieved with smaller wheels by use of a different sized drive sprocket to that of the sprocket on the rear wheel. In other words one rotation of the pedals could generate two or more rotations of the rear wheel. This meant that wheel sizes could be reduced and a new, safer design of bicycle was introduced by John Kemp Starley of England. Although now known as the “Safety” bicycle it was called The Rover and its appeal was immediately obvious; anyone could ride one. The “Safety” incorporated all the technical advances that the Penny Farthing had introduced with hollow tubing, ball bearings and wire spoked wheels, albeit another innovation was introduced with tangential spoking patterns which increases strength of the wheel and comfort for the rider. Another innovation was the use of pneumatic tyres, further increasing comfort by way of absorbing shocks in a way that previous small wheels were unable to do. And thus we have arrived at the essential form of the bicycle. The “Diamond” frame consists of three connected triangles, engineering perfection. Modern materials such as aluminium, carbon fibre or steel alloys provide lightness and stiffness but wire spoke wheels and pneumatic tyres provide sufficient shock absorption for these bikes to be ridden for 100 miles or more a day in comfort. A few tweaks of frame geometry provides a bike with relaxed frame angles and longer wheel-base suited to long distance touring. Tighten the geometry and you have a road racer such as used in the Tour de France. Tighten it again and you have an extreme machine for use on an ultra-smooth velodrome; a track bike (see the Bianchi at the very top of this blog). Steel alloy frames can easily be repaired in the event of an accident and the frame builder can express themselves creatively with beautiful “lug work” at the tube joints. Fixing points for various accessories such as pannier racks can be brazed on for extra strength and neatness. Chain drive provides options for up to 27 gear ratios on some bikes! There are bikes with relatively efficient suspension, pioneered by Alex Moulton who adapted his design for Mini suspension and applied it to his small-wheel bike of the 60’s, the small wheels necessitating the use of suspension. Relaunched for the 21st Century, the Moulton still features suspension with small wheels but also now uses a “space” frame. However the space frame is a complicated affair to build and lacks the simple elegance of Starley’s original diamond-frame design. Extreme suspension is found on specialist “downhill” racing mountain bikes. While modern materials do make suspension a practical proposition, any suspension complicates the essentially simple idea of a bicycle and also makes the bike less efficient as the suspension itself absorbs some of the rider’s energy which would otherwise be used for propulsion. The diamond frame bicycle has stood the test of time because it is a form factor that is dictated by the size and shape of the human body. The height of the seat tube is related to leg length. The length of the top tube is in proportion to upper body length. The width of the handle bars proportional to shoulder width. it is a perfect compromise. The bike is human powered and therefore weight, or lightness, has always been a factor. In its purest form, the track bike, it doesn’t even have brakes. With the exception of the introduction of more exotic building materials, it is difficult to see how this form factor can possibly be improved. 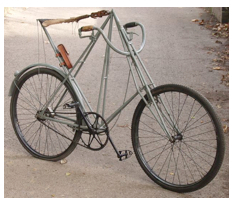 The diamond framed bicycle, invented over a Century ago, has become what Lewis Mumford in Art and Technics calls a “type object”, along with the safety pin and the loom. It is perhaps as close as we can get to the “Platonic” idea of a bicycle. Not because the form factor is perfect, but rather because the balance it achieves of utility, engineering, elegance, technology and design is a perfect compromise of form and function.